We’re a different kind of place. Paul’s Cigar Lounge is a place to relax…to gather with friends for great conversation and fine drinks. Lose your worries of the day. We provide a refined atmosphere for you to collect your thoughts and forget the stress of your day. We have the finest collection of drinks and cigars in the area. We are committed to providing our patrons an unforgettable experience through our commitment to service and quality. We also can host your next small group gathering or social outing. Stop on by today and experience refined relaxation. We are located in the truly historic Clarke-Buchanan Building on the corner of 2nd and Lincoln Streets in Downtown Hastings. Completely renovated, Paul’s Cigar Lounge offers an atmosphere unlike any other in the area. Read on about the importance of our building throughout Hastings’ history. Cities and agricultural areas need capital to finance growth. 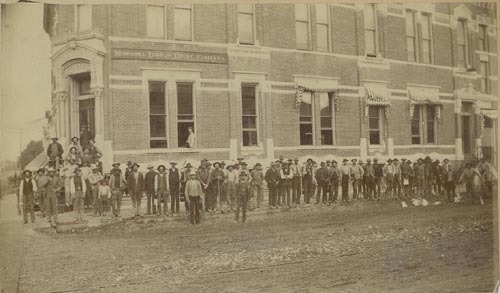 Nebraska Loan and Trust Company, organized in 1882 with Jas. B. Heartwell as president, helped fill that need in Hastings by providing a means for Eastern Capitalists to invest in Nebraska real estate mortgages. In 1883-84 they erected a large, ornate, L-shaped Victorian Italianate structure at Second and Lincoln. The building, which cost $35,000, was designed by C.C. Rittenhouse, and has three stories at the end sections and two stories above an elevated, rusticated stone basement, at the corner section. The stone trimmed brick walls are topped by a pressed-metal parapet. The primary entrance was originally located in the beveled corner, above street level, and reached by cast-iron staircases. About 1915 it was moved, along with its eclectic stone frontispiece, to the south side of the building. One of the original cast-iron store fronts remains on the Lincoln Avenue side of the building. In 1906 the Nebraska Loan and Trust Company voluntarily liquidated, and was succeeded by the Clarke-Buchanan Company, which conducted a lending business, investing its assets in Nebraska farm mortgages. The Great Depression resulted in dramatic declines in the value of agricultural land and the Clarke-Buchanan Company was placed in receivership in 1931. This building, which was placed on the National Register of Historic Places in 1978, is the sole survivor of three similar Hastings buildings. 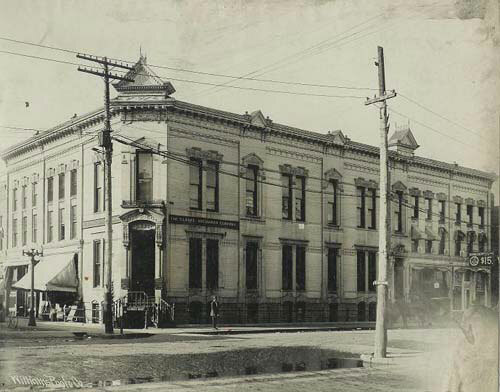 The other two were Kerr Opera House, which stood across the intersection at the southeast corner of Second and Lincoln, and First National Bank, which stood at the southwest corner of Second and Hastings.